Chisel out the existing mortar down to about ¾”. Start with all the head joints before moving to the bed joints. Clean out any excess mortar with the cleanout tool and the brush. Dip the brush in some water and dampen the brick. 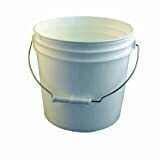 Put the mortar mix into a bucket and slowly add water. Mix with the trowel until the mortar has an oatmeal consistency. Put a small amount of mortar onto the finish trowel or the hawk, whichever is more comfortable. Hold the trowel up the joint, then push the mortar in using the flat jointer. Be careful to not get any mortar onto the face of the brick. Use the dry brush to clean off excess mortar. Mark used a premixed mortar, manufactured by SpecMix, in the color Moccasin. This particular mortar was purchased at The Brickyard, Inc, but should also be available at most local brickyards. Other tools used for this project, including the masonry hammer, chisel, bucket, trowel, and jointers, can all be purchased at a home center or masonry supply house.